A report from the District's Police Complaints Board found that D.C. police violated department policies while trying to breakup Inauguration Day protests and that the department didn't have enough officers working to manage the crowds for the Women's March the next day. 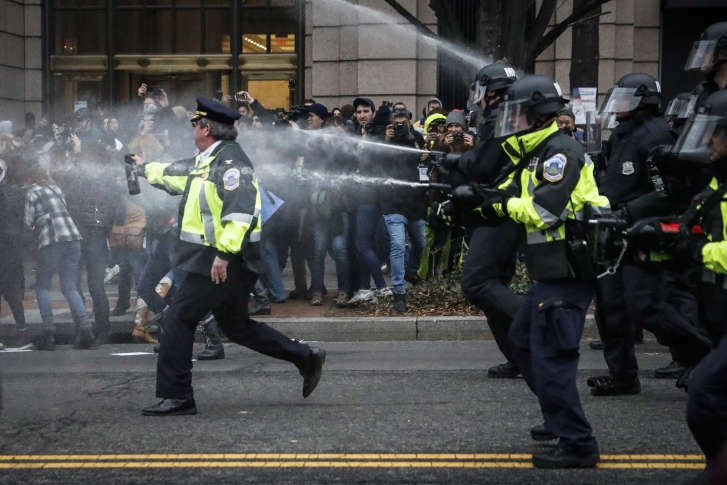 WASHINGTON — D.C. police indiscriminately used nonlethal weapons on demonstrators and arrested people who appeared to be breaking no laws during inauguration protests at Franklin Square, according to a civilian review board that oversees the conduct of the District’s police force. In a 16-page report to Mayor Muriel Bowser, the D.C. Council and acting Police Chief Peter Newsham, the Police Complaints Board says its monitors witnessed multiple incidents in which District officers appeared to violate the department’s own procedures for ensuring citizen’s First Amendment rights. There’s been no comment yet on the report’s findings from the mayor’s office or Newsham. “What we saw that day, on the day of the inauguration, is that those rights were not followed in all instances,” said Michael Tobin, executive director of the Office of Police Complaints. Among the allegations is that police used pepper spray and stingers, ball-like grenades that spray rubber pellets, on demonstrators without warning and seemingly without orders from police commanders. “We observed instances where those munitions were being deployed without a prior warning or at least we could not hear a prior warning,” Tobin said, adding that it’s unclear if officers were acting on their own. “We were unable to determine, based on our observations, whether appropriate orders were given, in each and every instance, to deploy the Stingers and to deploy pepper spray,” Tobin said. The Police Complaints Board says its own protest monitors were hit by pepper spray and rubber pellets because of their “indiscriminate use” by officers. “Two of the investigators in my office that were acting as monitors were impacted by the pepper spray and the stingers,” Tobin said. Another First Amendment concern raised in the report was the roundup and arrest of demonstrators, legal observers and news reporters watching but not taking part in violent protests at Franklin Square. “We did observe persons being arrested that did not appear to be involved with the property damage,” Tobin said. The report recommends a deeper investigation of police actions that day including a review of video from police body-worn cameras, aerial surveillance and arrest reports. “Our report is a snapshot in time, it’s an observational report,” Tobin said, “that’s something that we as a community need to look at further and in much greater depth than we were able to do on that date,” he said. A second report to the mayor, council and police chief on police conduct during the Women’s March, the day after the inauguration, finds that D.C. police respected the First Amendment rights of the thousands who attended. But the second report on the march found there were not enough police officers on duty downtown following the protest despite the overwhelming crowds. The report also criticized several D.C. police officers who substituted their uniform hats for pink caps similar to those warn by the marchers, a violation of D.C. police procedures that prohibit officers from engaging in any political activity while in uniform or while on duty.